I have to admit it, I love the original Batman vs Predator more than the writer/artist Frank Miller's The Dark Knight Returns. This is because I read TDKR after plenty of issues of Wizard, Hero and other comic magazines had given away the key beats, which might've changed that stat had I read the iconic story-arc fresh. Bat vs Predator had something fresh though, it was my introduction to the art of brothers Adam and Andy Kubert. 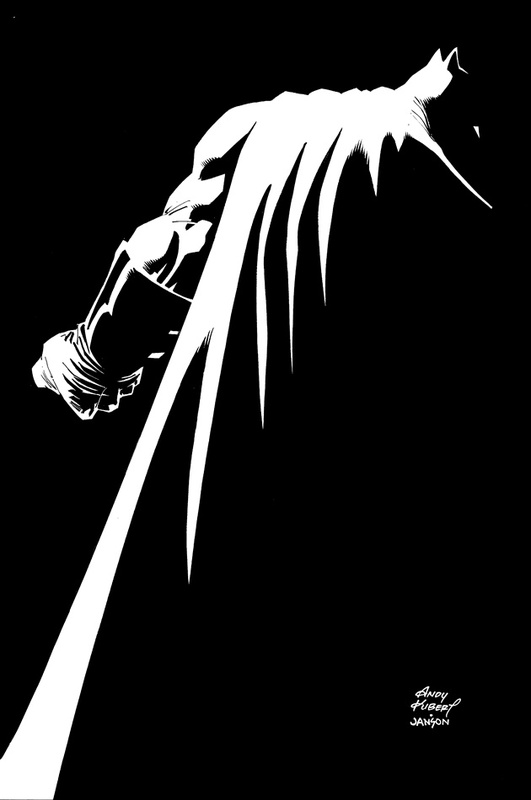 The same Andy it was revealed today who would be returning to the caped crusader with longtime Miller inker Klaus Janson to work on The Dark Knight III: The Master Race. Yes, the upcoming series literally will combine the best of both worlds. Co-written by the awesome Brian Azzarello, installments of the eight-issue 32 page series will feature 16 page back-up stories profiling other bat-universe characters by other creative teams. Sure there was also news Geoff Johns will get to co-write the next live-action Batman film, but this is just as sweet. In fact, from this fan's perspective, if all the art is rendered in a nod to Miller's Sin City-ish style like the promo art shown here, I wouldn't mind if the only thing missing from this series is a colourist. That art doesn't need one.